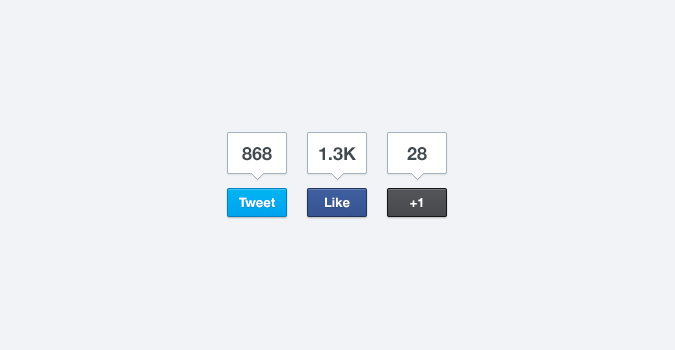 Today’s quick freebie is a bunch of social media sharing buttons. If you want to create a more uniform look, rather than using any official buttons, here’s your starting point. Implementation shouldn’t be too difficult either using Sharrre, a sweet little script for customising buttons. Any chance we can have this coded ? Yep, just perfect and very stylish. Excellent work as always Orman! I’ve long done similar and suggested this across many sites I’ve worked on for the sake of uniformity and a clean look across the brand. Thank you very much Orman Clark. Plain and simple is always such a refreshing and awesome design. I just downloaded this social button thanks! I wondered why the 30,000 RSS subscribers didn’t increase to 30,001 after I subscribed. Is it static? Grace, beauty and simplicity all at one place. Bravo! It’s very good! Thank you very much! Thanks for this Orman, awesome stuff as usual. I’ve just turned this into a CSS version for a personal project, hope thats OK – will take down if its not cool with you, the download links here http://dribbble.com/shots/1016881-Social-Share-Buttons-CSS Thanks again! I like those Social Media Sharing Buttons. I’ll use them in my blog. Great job!!! Thanks for the buttons, they look awesome!